Here’s a quick breakdown on the biggest food news of the day, in a short, easily digestible form. As wild fish populations diminish, it’s no wonder genetically modified salmon is seen as a solution. The product of a company called AquaBounty Technologies, the AquaVantage™ salmon combines the DNA from an Atlantic salmon, Chinook salmon, and an eel-like fish called an ocean pout. This magic combination allows the fish to grow all year round — even during the cold months when most salmon stop. The AquaVantage™ fish reach market weight in around half the time of their conventionally farmed counterparts. While farming more fish with fewer resources sounds like a great option, there’s a catch — and we don’t mean a catch of the day. As a 60-day FDA evaluation period of GM salmon gets underway, it’s important to note that there have been no independent studies of the fish. In fact, while AquaBounty claims the animal is safe, they’re basing their claims solely on their own research. Secondly, these are the first genetically engineered animals to be evaluated by the FDA, meaning there’s no precedent and therefore no existing standards. 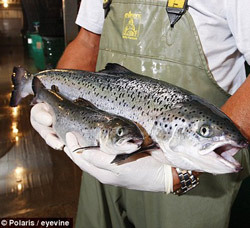 Although the salmon’s very genetics will be altered, The FDA is using standards for animals treated with pharmaceuticals. And thirdly, there is always the chance of escape and interbreeding with wild salmon populations, as well as other interference with surrounding ecosystems. The FDA is planning public hearings to discuss the approval process later this month, so now is the time for concerned consumers to add their feedback. When it comes to assessing organic produce, scientific research tends to be narrowly focused on nutritional content, while ignoring pesticide residue, which is arguably an equally important factor in choosing healthy food. Thus far, such research has looked a little like a pendulum; one study proclaims organic’s superior nutritional value, and the next study says just the opposite. The latest study, however, might be the most comprehensive to date. 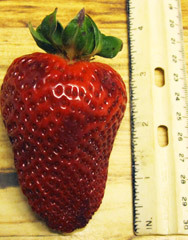 A team of scientists from Washington State University analyzed three strawberry varieties on more than two dozen commercial California fields — 13 conventional and 13 organic. They also studied the soil in which the berries had grown. They found that organic strawberries had “significantly higher antioxidant activity and concentrations of ascorbic acid [Vitamin C] and phenolic compounds than conventionally grown berries.” The researchers also found that — surprise surprise — organic soils “excelled in a variety of key chemical and biological properties, including carbon sequestration, nitrogen, microbial biomass, enzyme activities, and micronutrients.” While the science makes it clear that ecosystem health is an important benefit of organic farming, it stops short of directly tying soil health to human health.